Fireflies and Jellybeans: Felt Fruit Sorter Project! These sorting fruit baskets are discontinued. It is the inspiration to what I want to make for one of my son's Christmas gifts this year. Even if it was not discontinued, I would probably make it anyway, because I am cheap like that! Not only are these sorting fruit baskets cute, they can be used educationally too. 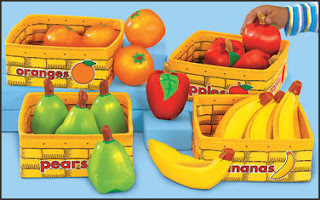 They can help teach fruits, colors, sorting, counting and patterns. All while your little one thinks that they are playing! How much fun is that! I am going to start a series of tutorials on how to make these fruit baskets for your kids or nieces or nephews. I am going to make bananas, strawberries, apples, oranges, (maybe a kiwi and a pear), and also the baskets. I am also hoping that my hubby will help make a little shelf to keep them on, or I might just get a tote to keep them in. Felt in the following colors: yellow, cream, white, green, red, orange, and brown. needle and thread to hand sew some details. The first fruit we are going make is the banana! It is probably the easiest and the cutest! I would love to see your progress as we make these. Let me know if you are following along, post about this on your blog I would love to link to you weekly! Wont this be so much fun!?! Seriously such a cute idea, I wish I could follow, but unfortunately this isn't my month, I will be checking in, and possibly be able to do it in the future. I actually have my own plans to make fruits and veggies to go with the book Lunch by denise Fleming. I will make a mouse puppet too. I have my fruits/veggies sketched out. If you need to bounce ideas off someone, I'd be happy to help! PS Strawberries super easy! And there are lots of free patterns out there! Even if you cant do it now the tutorials will be here waiting for you when you are ready! Just look for the Fruit Sorter label! Annette- thanks for the help! I may e-mail you about the pear... I really want to make one, but I don't have a pattern for it yet. Yes- Strawberries are so fun and are one of the easier ones to make! I was also thinking of adding some veggies too like carrotes, tomatos, lettus... so many options! I love felt food!